Housing Services now has its own Twitter account, follow us here for the latest news and information about housing in Havering. If you get a call from AEW Property Services wanting to carry out electrical tests at your home it will be a genuine call. A selection of 500 properties has been chosen and the call will be to set up an appointment to test all the electrical wiring in your home which helps the Council plan future investment. The contractors will carry identification and if you have any doubts, keep them out until you have checked with the Council they are genuine. Meetings are being held for residents living near sites which are being regenerated to let them know what is planned for each area. There are limited places available at each venue and pre-booking is essential. Anyone can access the London Fire Brigade website and book a Home Fire Safety Visit. Those liable to intoxication through alcohol and/or drug use. Progress on the new community centre, behind Highfield Towers in Collier Row, is contuing on schedule for opening this summer. 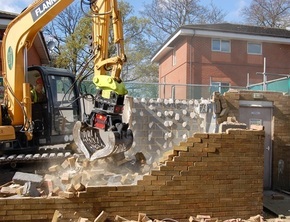 Demolition of the old centre is completed and during the next two weeks there will be a lot of work on site. Residents are asked to make sure they do not park to block the access road. There will also be some limited weekend working. Pile driving begins to start foundations of new community centre. Vibrations from piling should be minimal, Driven piling duration is anticipated to be two days . Vibration levels will be monitored on all buildings within affected area. Drilling scheduled to start on site to allow installation of the ground source heating system. If you are interested in hiring the new community hall please contact Joanne Mahony. 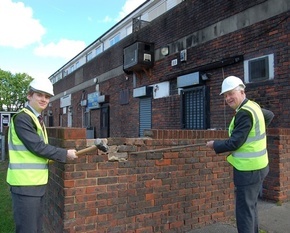 Work has started on a scheme in Briar Road, Harold Hill which will see 10 homes for Low Cost Home Ownership and 36 flats for social rent. More information available here including video clip. Following the success of a Pamper Evening last month (pictured), PETRA TMO is offering the chance for residents on the estate to enjoy head and shoulder massages, facials and general well-being treatments from 6pm on Thursday 11 May. More details from Ravinder Kaur. If you’re looking for a hall for a family celebration or event Hacton Lane Hall in Hornchurch could be just what you need. With competitive prices and good facilities, including on site car parking, this is an ideal venue. Reserve your booking online here. Can you be a Housebound Hero? Havering Library Service needs volunteers who can spend a minimum of three hours per week to deliver books and items to Havering residents in their own homes. The Housebound service enables people who can’t visit a library in person to still access our service. Travel expenses including petrol will be paid for. Volunteers for this role may be required to undergo a Disclosure and Barring Service check. Get more details from Donna Byrne. Do it in a day means our contractor, Breyer Group, will be carrying out all the repairs at a specific location on the same day. Tenants should still report repairs in the normal way, so Breyer Group knows how many staff and what equipment may be needed to do the repairs. However, if you see the contractor is working in your street and you have a non-urgent repair, you can report it directly to them and they will try to get it fixed for you on that day. Napier House, New Plymouth House, Dunedin Road, Gisborne Gardens, Queenstown Gardens, New Zealand Way, Christchurch Avenue, Auckland Avenue. Queen Street, Waterloo Gardens, St. Andrew’s Road, William Pike House, Thomas England House, Queen Street Villas. Highfield Road, Hillrise Road, Highfield Towers, Highfield Link, Hendon Gardens, Harlow Gardens. Get details of the scheme here. Tenants and leaseholders are responsible for many basic repairs to their properties, so before logging a report please check if it is up to you to do the repair or whether the Council is responsible. Find out full details of your responsibilities here. If you want to check what we’ve said before, back copies of At the Heart online can be found here. Act fast to book your appointment! Friday 28 April, 4pm – 6pm, Hacton Hall, Haydock Close, Hornchurch, RM12 6EA. Friday 26 May, 4pm – 6pm, Town Hall, Main Road, Romford, RM1 3BB. Details of future housing surgeries can be found here. Deputy Leader of the Council and Cabinet Member for Housing, Councillor Damian White, and his colleague, Councillor Jason Frost, will be holding three day-time surgeries in June at The Salvation Army, 50 High Street, Romford Town Centre, RM1 1JJ. The crackdown on people illegally subletting their Council home, making or wrongly claiming benefits of Council Tax relief has saved the Council more than £4 million. That figure is after the cost of employing extra officers who have made 22,463 visits to Council tenants and 2,219 visits to PSL Tenants since October 2015. There have been 35 Council homes brought back for genuine tenants to use and 44 Right to Buy applications cancelled. A number of prosecutions are also taking place. The message is clear: if you're breaking your tenancy agreement admit it now because you WILL be caught and then could lose your home. All the sessions start at 10am and we’re aiming to be finished by 1pm but you don’t need to be there the whole time. Every hour you can spare will be put to good use, so if you want to help out please let us know using the form on the website. Meetings are being held with development companies that are interested in working with Havering Council to deliver the Housing Regeneration Programme. The aim is to identify the best company that has the ability to deliver the programme in the way the Council wants it to be delivered. A final decision on which company will be chosen will take place at the end of 2017. Meetings continue to inform residents about plans for these possible future developments. All job clubs are open to any Havering resident who would like help to find work. For more information complete the request form here. Jobcentre Plus offers a universal jobs match service which allows you to look for vacancies online. More information available here. Sign up to the My Havering service and you can then access a wide range of services 24 hours a day, seven days a week through the website. You can apply to move house, get energy efficiency advice, rent a garage, and much more. You can also pay your housing or garage rent and Council Tax by Direct Debit by completing and returning the online form. You can pay online using credit or debit cards. The Report It service is available to let the Council know about community and neighbourhood issues; housing issues; recycling and waste collection concerns and a lot more. Havering Council has produced a special information booklet that you can read online here. If you have a question about any aspect of housing, there is now just one form to complete, which will reach the right people to answer your question. Just complete the online form here. Facebook is an ideal way to keep in touch with family and friends, and now you can use it to keep informed about what’s happening with Havering Council Housing Services. If you ‘like’ us you will then get alerts when we add news to our page, including details of job opportunities, training courses, events and useful information. Like us on Facebook. This update is sent to keep you up-to-date on Havering Council news on Housing. We hope you find this information useful and will encourage friends, family and colleagues interested to subscribe too. Keep up-to-date with other news from Havering Council by signing up for our award winning email updates then choose the topics that are of interest to you. The full list of email updates currently produced by Havering Council can be seen here. You can access information on everything happening in Havering by visiting our website. You can also follow us on Twitter @LBHHousing, check out the Havering YouTube channel, see us on Instagram and stay up-to-date with Havering events on our Facebook page.